A balloon is a type of aircraft consisting of a thin envelope filled with a gas less dense than the surrounding air. The envelope can be made of rubber, plastic, treated paper or cloth, or other material through which gases cannot seep. Ordinary party balloons are good models for most kinds of balloon. They are made of rubber that expands when air is blown into them. And the air from a person's breath used to inflate them is less dense than the surrounding air. A balloon rises in the air for the same reason that a cork floats in water. Just as a cork's density is less than the density of the surrounding water, so a balloon's density is less than the air around it. The lower-density object, then, is pushed upward by the surrounding higher-density medium. It stands to reason, then, that the best gas to use in a balloon is the one with the lowest density: hydrogen. In fact, hydrogen was used in the construction of balloons for more than a century. But this gas has one serious drawback. It burns easily and, under the proper circumstances, can even explode. The tragic fire that destroyed the Hindenburg dirigible (airship) in 1937 occurred when lightning set fire to hydrogen gas inside it. Because of hydrogen's flammability, the most popular gas for filling commercial balloons is helium, the second-least dense gas after hydrogen. Helium has 93 percent of the lifting capacity of hydrogen with none of its safety concerns. The problem is that helium is more expensive than is hydrogen. Still, balloons used for commercial and research purposes today almost always use helium as the lifting gas. Another gas used in balloons is hot air. Hot air has the same chemical composition as ordinary air but, because of its temperature, is less dense that the air around it. Balloons used for sight-seeing and sport usually use hot air. The gondola (traveling compartment) below the balloon itself contains a heating unit that warms air and then pushes it up into the balloon. Vertical (upward or downward) movement of a balloon is generally under human control. In a sight-seeing balloon, the operator can turn the heater on and off to produce more or less hot air. Changes in the amount of hot air make the balloon rise or fall. Vents in the balloon envelope also make it possible to control the amount of gas inside the balloon, therefore changing its vertical movement. The horizontal movement of a balloon is beyond human control, however. 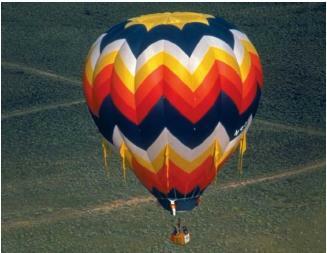 Once a balloon has left Earth's surface, its horizontal motion is dependent on wind currents. Joseph (1740–1810) and Jacques Montgolfier (1745–1799) are considered the fathers of ballooning. In 1783, after a series of experiments, the brothers constructed a balloon large enough to carry two humans into the atmosphere, the first manned aircraft. The suitability of balloons for making atmospheric observations soon became evident, and manned balloon trips soon became common. In 1804, for example, French physicist Joseph Louis Gay-Lussac (1778–1850) traveled to an altitude of 23,000 feet and collected a sample of air. He found that air at that altitude was identical to air at Earth's surface. In his ascent, Gay-Lussac nearly reached the limits of manned balloon trips without special protection. In contrast, in 1863, two English scientists, James Glaisher and Henry Tracey Coxwell (1819–1900), traveled to a height of over 33,000 feet to study the properties of the upper atmosphere. At that height, the air is so thin that the two men nearly lost their lives. The greatest of the early balloonists, however, was French meteorologist Léon Philippe Teisserenc de Bort (1855–1913). Over a three-year period between 1899 and 1902, de Bort launched 236 balloons with instruments designed to measure atmospheric conditions. Scientists are now able to use life-support systems, such as those that are common in space flights, to travel to higher and higher reaches of the atmosphere. The current record is held by two Americans, Ross and Prather, who reached an altitude of 113,740 feet in 1961.
properties of air at some altitude. Each day, thousands of these radiosonde-carrying balloons (called balloonsondes) measure all possible characteristics of the atmosphere around the world. Meteorologists depend on this information for making short- and long-term weather forecasts. Balloons are also used extensively for astronomical research. Their advantage is that they can take telescopes high enough into the atmosphere that they will not be affected by dust, water vapor, smoke, and other forms of air pollution. Telescopes with a diameter of up to three feet are placed on platforms which are supported by mammoth balloons as tall as eight-story buildings. These telescopes have been carried to altitudes of 120,000 feet. 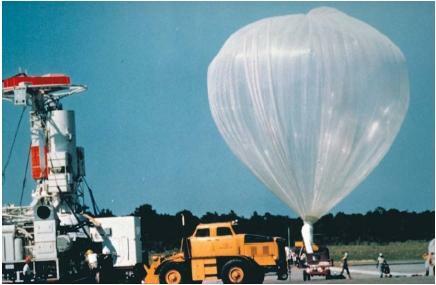 The Russian mission to Venus in 1985 used two helium balloons to study the motion of the Venusian atmosphere. For 46 hours, they floated above Venus with an attached package of scientific equipment that analyzed the environment and transmitted information directly to Earth. joined to each other. During the day, the air balloon, heated by the Sun, would drift in the Martian atmosphere with a payload of instruments. At night, the air balloon would cool and descend to the ground, where it would stay, supported in the upright position by the smaller gas balloon. Thus, the same probe would perform the on-ground experiments at night and the atmospheric experiments during the day, traveling from one location to another.